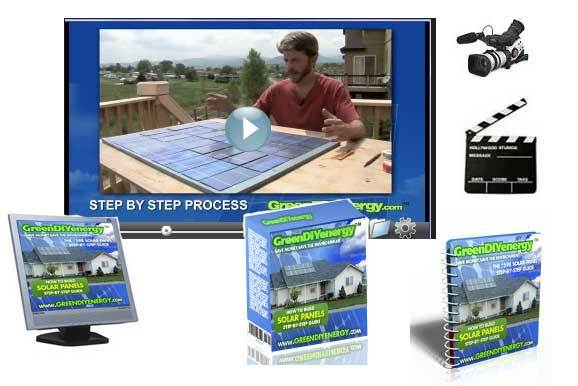 In the second instructional video of Green DIY Energy “Build your own solar panel for less than $100”, there are 3 sections. In the first section, the host, Bryan Clark talks about the multi-meter. In the second section, he covers the Photovoltaic testing block and finally in the third section, you will learn how to construct a solar panel frame. One of the most important tools you’ll need to have when building a home solar panel is the multi-meter. The function of the multi-meter is to measure the voltage and current generated by the solar cells. If you have never used a multi-meter before, this video will give you’re a quick walk through of all the features on the device. It is important where and how you connect the testing rod. It is also imperative where you set the dial on the multi-meter. If you are not careful, you will get an incorrect reading from the device. Why do you need a PV cell testing block? More importantly, what is it? A solar cell has a front side and a back site. There are electrodes on the front and contact points at the back. Before we use the solar cell, we want to know if it is in working order. If you are buying cheap solar cells from auction site such as Ebay, you want to check each and every cell to make sure it is working. To do that, you have to check the current it is producing with the multi-meter. To get the correct readings from the solar cell, the testing rod of the multi-meter has to touch both the front electrodes and back contact point at the same time. As you can see, this is quite a difficult task. To make the testing easier and faster, Byran is showing us a device specially made to help you with the testing of the solar cells. It is call the “PV cell testing block”. In this section of the video, Bryan walks us through the process of making the solar panel frame. In this section, you’ll learn to calculate the amount of power that will be generated by a series of PV cells. The calculation will involve a basic formula. The idea is to make a solar panel that will generate 18 volts. To do that, you have to connect 36 solar cells in series. The question is, how do you arrange them in the solar panel to have to most efficient rating? From the video, you will see 2 popular arrangements of the PV cells. You can either use the 4 cells across x 9 cells down or 3 cells across x 12 cells down arrangement. Each arrangement has its own advantages and disadvantages. For more information on the homemade solar power system guide, check out the comprehensive Green DIY Energy review on this web site.